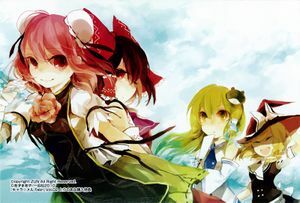 Touhou Ibarakasen (Rose Poem Hermit) ~ Wild and Horned Hermit (東方茨歌仙　～ Wild and Horned Hermit) is a Touhou comic published by Ichijinsha in Febri, formerly Chara☆Mel Febri beginning on July 24, 2010. The story is written by ZUN, with illustration by Aya Azuma. It introduces Kasen Ibaraki, aka Kasen Ibara, a girl of unknown nature and ability who seems to have some sort of connection to the existing cast. MangaDex: Touhou Ibara Kasen ~ Wild and Horned Hermit. Released by Gaku Gaku Animal Land, Alpha Beta Kappa (Clarste, et al.) and Reality Dreamers. Compilation of Volume 1 - 5. Comic REX exclusive promotional bonus comics that were never reprinted in the tankoubon volumes.